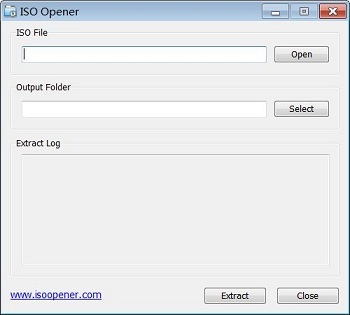 ISO Opener is a free iso extractor for extracting files from the ISO files, this ISO extractor can help you to directly extract all files and folders form the disc image file, so you do not need the virtual CD-ROM, no need to burn DVD/CD discs, just use this program you can easily access the contents of the ISO image file. After the installation is complete, run the software and choice an iso file, then specify an output folder, press the "Extract" button to start extracting files. Please note that there should have enough space left in the output folder on the disk, the required disk space size is basically the same as the ISO file that you specified, if disk space is not enough, the extraction operation will be terminated. After the software start the extraction process, the generated files will be stored to your specified output directory, if the ISO file contains the folder, the software will automatically create a corresponding folder. The "Extract Log" section will show a detailed work log. Finally, after the file extraction is complete, this software will prompt the total number of extracted files and folders, as well as the total of output file size. Please note that this software can open and extract most of the standard ISO file, such as ISO 9660 format, but may not be able to open a specially formatted ISO file, as some game CD/DVD ISO files.